Ever since 'Harry Potter and the Deathly Hallows' was split into two movies, despite being one book, films such as 'Twilight: Breaking Dawn' have followed it's lead. 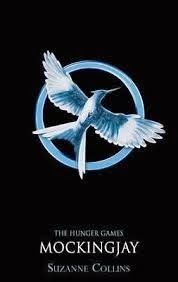 Now, it's 'The Hunger Games' that is joining this group - with the final book of the trilogy, 'Mockingjay', having Part 1 adapted this year, with the conclusion of the franchise taking place next year with the release of 'The Hunger Games: Mockingjay(Part 2)'. For some people, this is something they hate; believing that it is only a way for the companies behind the films to make more money out of it's teenage audiences, and for others, it's an idea they adore. When the announcement came that 'Mockingjay' would be split into two, I would be lying to say I was surprised. Hesitant, of course, but I did see it coming. The final book in the 'Hunger Games' series is one that builds up to an extremely emotional climax and, without that in Part 1, will it be seen as 'boring' - possibly? Sometimes, not all, there is just not enough content in a novel to make it work as two movies. This could be seen as the case for 'Mockingjay', where most of the action and excitement, rather than the build-up to it, happens near to the end of 'Part II - The Assault'(where Peeta reveals information to warn those in District 13 about a bombing). Does this mean that Part 1 will lack any of the gripping, heart-pounding and emotional scenes we are used to from the books, and the movies? This is the case for any book in the final series being split. When you reach it, the following of them is huge; and, there is no doubt that fans want the best adaptation. Yes, there's another film, but is there always enough to make one that won't be boring? You expect the biggest shocks to come at the end of the last book, which they do. So, what will happen to Part 1? One of the main reasons for making two parts is the money. YA Adaptations have been doing incredibly well at the box-office recently; and it seems like they are not going to stop. This year alone, there are both stand-alone adaptations and new series' starting - recently 'The Fault in Our Stars' movie caused a huge amount of excitement when just the trailer was released - so, if a series is doing well, why finish? This is very much the case for 'The Hunger Games', since 'Catching Fire' was the biggest film of 2013 in the US last year, and broke too many records to list here. Clearly, if there's a chance not to just repeat it once, but twice, making even more money, it is going to be grasped with both hands? However, I hate to think that the only reason these books are being adapted is because of the money they make - which is quite manipulative. There are other, much more important reasons for adapting a book - such as the themes, which can change a generation - rather than just the amount of money it will gross. I love book-to-film adaptations and I can be someone who likes seeing the conclusion of a series being split in two. I need the attention-to-detail that a longer running-time over two films can provide. Not only does this mean I get to see more from the characters I could connect to, or the world that I pictured in my mind, but the back-stories and more complicated details can be there. All of this detail is on my 'must have' list for adaptations - as the smaller scenes that don't move on the film as quickly if there's a limited time would have to be cut-out. Not only does having two films scream, "MORE BOOK SCENES! " at me, but it also means that these books that have inspired us can continue to make their way to the screen for a slightly longer time. There's another year of waiting for trailers, reacting to them, sticking posters up on your bedroom wall and anxiously awaiting release-date. When you love a series you just want it to continue - and trilogies are quite short anyway. So, do you have a love or hate relationship with the final book in a series being split into two films? Tell me in the comments! I can definitely see the perks of a split adaption, double the fun! But I personally found Mockingjay boring as one book (although I did enjoy it) so I don't know how I'm going to find two movies. So I would be lying if I said this didn't make me nervous. But I 'm excited anyway. I totally get what you mean, Breaking Dawn pt1 is basically just a lead up to part 2 and it was my least favourite of the movies but pt 2 was great! I hope that this time they'll both be great. Great discussion! I haven't read Mockingjay yet but I find it so annoying that it's been split into two. You're right a lot of it is about the money but I just wish they wouldn't. Isn't Mockingjay the shortest out of the three books? If so then it's not really necessary. I don't know but once I've read it I'll be able to have a full opinion. It kind of annoys me when the final book is split into two films because it's always seemed to me like just a way to make more money (plus it keeps us waiting for the last film even longer!) - however my sister is on the other side and loves it because it means more movie time! I guess I can see it from both perspectives... Great post! I think it worked with HP because it was so long and detailed as a book, but I'm not sure it will with THG. I don't like Twilight, so, I can't comment! It's kinda obvious it's all for the money, and I'm going to hate the wait... but... more merch? More stills? Those are good. Awesome post Sophie! I normally hate the split because I get really impatient but I can see why they're necessary. Nobody wants to sit in the cinema for near on four hours at a time! Thank you so much for taking the time to read - and comment on - this blog post! I read and reply to every comment, so feel free to ask any questions and I'll answer! Feel free to add it to your blog! Discussion: Should more serious-topics be dealt with in books? DISCUSSION: Does reading have competition? Designed by Amber from The Mile Long Bookshelf, who understands my obsession with Starbucks! I loved this book! One of my favourites! I really liked this! With a few 'tweaks' it would have been perfect. I liked this novel. Despite some problems, I'd still recommend it! There were quite a few problems with this novel - but I still found some enjoyment. Sadly, I didn't enjoy this novel. Not one I would recommend. From August 2014, all pictures used on this blog are my own, unless otherwise stated. For posts before that date, when my own pictures have been used, it is mentioned at the bottom of the post. I do not take credit for other images used on this blog; that is the owner's. If a picture/piece of text belongs to you and, as the owner, you believe it should be removed, please contact me. It will be removed in 3-5 days if I feel it is the fair decision. Reviews and discussion posts include my own - the author's - own opinion, and this is not meant to be offensive under any circumstances. All poems and short stories on this site are my own and should not be stolen or used in any other way without my permission first. This is just a quick note to say I do not get compensated in any way to write positive(or negative) reviews of any books on this blog. In return for a free copy of the novel, I give an honest review of the book. From September 2013, all books I have received in exchange for an honest review will have it clearly started at the bottom. Other books, for example my own copies, will not have this as they are my own books. This is to make sure I am not, in anyway, going against guidelines that I need to follow. If I ever do I sponsored post on the blog, it will be clearly stated from the above date that I was compensated to do so. All work(apart from where specified) is the property of Sophie Louise. Simple theme. Theme images by digi_guru. Powered by Blogger.